For bedroom and studio use this is perfect, but if you mostly play live, other PODs could be better suited. High quality simulations. Almost every parameter is tweakable. Intuitive. For live performance the HD500 is a better option. Don't be intimidated by all the buttons - a backlit LCD screen tells you exactly which amps and effects are in your signal chain. Yes, you'll find POD desktop units with more amp models, but the quality of the HD simulations is totally mind-blowing. Once upon a time, there was a magic bean. But it didn't sprout some lame beanstalk, it simulated vintage amps and pedals, made blindfolded connoisseurs look like fools and ignited the modelling boom. That was the original POD in '97 and while countless variants have landed since, the concept's still the same - simulation, with the operative words 'better' and 'more'. And so we reach the HD: a desktop take on the HD500. The two key questions that accompany a new POD release are: 'How many?' and 'Any good?' Seems like Line 6 is pushing quality here, touting the dead-on accuracy of the new-ish High Definition models that "contain up to 10 times more amplifier DNA". Big talk, but it's certainly included some crackers, from schoolboy fantasy clichés (Fender Twin) to curiosities (Divided By 13 JTR). Let's stop number crunching: the HD has enough. At no point did we lament, 'If only there was a Diezel Herbert,' especially since PODs are known for tweakability. We don't want to labour the point about operation, it's old news now, but it's worth reiterating to technophobes just how intuitive these units are. All the old-school dials from a traditional amp dash are present, so it's just a case of scrolling along the signal chain - as represented by stompers and amps on the LCD screen - and adjusting, removing or adding effects up to the maximum of eight at once. And that's before you even get to the Edit software. OK, let's talk quality. We've been wowed by POD simulations in the past and we'd say the HD factor does make a difference, just one that's more 'black-and-grey' than 'black-and-white'. Taking the JCM800 as a benchmark, you can feel the warm, organic response as you push the virtual valves and even subtle factors like a tiny roll-off of your guitar's volume spark the kind of sweet spot you'd expect in real life. But 10 times better than before? Hmm. Ultimately, you've got to be clear about your goals. 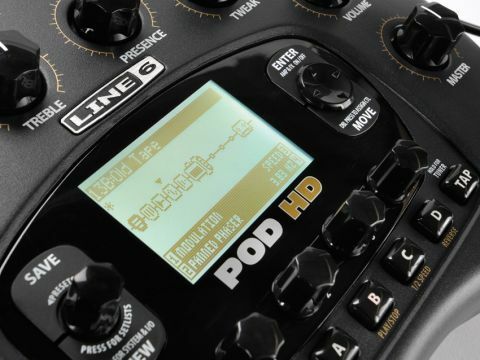 If you own a recent POD, we wouldn't say it's imperative that you upgrade now. If you mostly play live, we'd go for the similarly priced HD500, because this unit's weeny screen, tiny buttons and studio-centric input and outputs won't cut it onstage. Even if you add the EX1 pedal (£45), you still won't have the same control. The flip side is that if you're a bedroom boffin assembling a masterpiece, this is dynamite. So it's another killer Line 6 product, tempered with a slight migraine. The POD's still our god, but choosing which one to worship is becoming a dilemma.